Wins at Amazon. Wins at airports. WE WON’T STOP. IT’S WORKING. Amazon announced today that they are moving all employees to $15/hr — just days after 40,000 New York City airport workers won a $19/hr wage! This is thanks to the passion and advocacy of the Fight for $15 workers who’ve been speaking out, walking off the job, and marching for years. But this movement isn’t decided by a single victory. The rigged economy is working against too many of us, and all workers — including those at Amazon and airports — won’t be safe until they have a union. 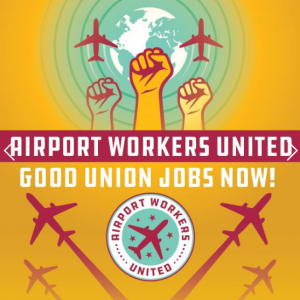 That’s why the Fight for $15 is ON STRIKE for Unions for All right now at airports around the world today — with additional strikes happening across the country over the coming days.